Weld-On Grab Hooks (weldable grab hooks) are designed not for use in lifting application, but to be welded onto tractor buckets or trailers for a quick and easy chain attachment point. The working load limit of each type forged weld on grab hook is different due to different weight bearing capabilities. The higher the weight, the heavier it could bearing. Considering the application of weld on grab hooks, such products are always produced in steel forging. 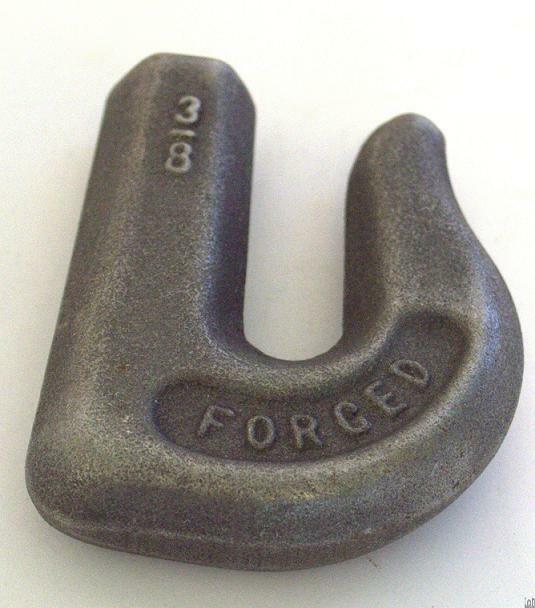 Our forging process could increase the strength of grab hooks, which is not available in casting. Material: Forged steel. Material grade could be 1045 carbon steel. Or, alloy steel is also available. Process: Closed die forging. Firstly, forging dies are precision machined from tool steel with our advanced CNC centers. Then, sawing the round bars to length following the specification of weld on grad hooks, the heating them to a certain temperture by medium frequency furnace. Next step, the heated bars will be delivered to our forging press under forging dies, and forged in several seconds to desired dimensions. Finally, trimming and shot blasting to final net shapes. Surface treatment: Anti-rust paiting for self color, or painting. Forging can be used to create weld on grab hooks made out of almost all dimensions. So all types of weld on grab hooks could be produced in our closed die forging process. Forging is able to produce net shaped weld on grab hooks. As a result, these forged hooks require no machining, which saves lots of machining cost and time. Forged weld on grab hooks provide better mechanical properties than cast ones. During forging process, internal grain structure will be formed, also the strength and working performance will be increased. It’s ability to support high production runs make it one of the most cost effective metalworking process for forged weld on grab hooks. Normally we could finish forged weld on grab hooks around 4-5 weeks. Having pioneered the fastest set-up times in the industry, we are responsive and efficient in serving our customers’ diverse needs. We do not dictate run quantities or minimum orders, and are uniquely poised to produce lot sizes for large-scale serial production, small runs and everything in between. We routinely produce forged weld on grab hooks as well as other forged components with complex geometries, ranging in size from a few ounces to 60 pounds. We forge carbon, alloy, stainless and high-temperature steels as well as other materials. Our engineering team works side-by-side with our customers to streamline the die design process. We also house our own die shop, which allows us to complete the dies in a fraction of the time compared to forging companies that must outsource their die design and die builds. We offer forging, die design and manufacturing, heat treating, machining, assembling, plating, painting, material testing and certification services — all in-house or with trusted outside vendors. Since 1995, we’ve maintained our mission of delivering exceptional customer service. We have been ISO-9000 certified since 1998. We believe in continual reinvestment in our facilities and equipment. Today, Fly Forge houses state-of-the-art computer-controlled hydraulic hammers, ensuring both efficient production and superior quality, from part-to-part.